– as published in Kfar Chabad Magazine, Volume 1079, 5 Shevat 5764 (January 28, 2004) Page 35. Your attitude appears presumptuous and unbecoming. You demand to know why Chabad-Lubavitch representatives (“shluchim”) are not doing anything or are not doing enough, related to this problem that you are very concerned with. Not only this, but your letter is tasteless and illogical, because your questions would be no more logical if you asked a physician why he is not actively involved in a matter related to engineering. Furthermore, there is very little -- if anything -- they can achieve in the area that interests you most. Therefore, to divert their minds and to turn their energies and their time to something not related to their mission will be wasteful and diversionary to the work that they already do superbly and with full devotion. The impression received from your letter is that you are probably not familiar with the correct way to achieve success for the cause you are so eager to work for. 1. Remember the law ("din kadima") that the needs of the poor of your own city come first. Did all the Jews in your city receive adequate necessities to cover their Jewish [i.e., spiritual] needs? If not, why not? 2. What have you done and what are you currently doing -- are you doing all you can? -- to convince and encourage the Jews in your community -- men, women and children -- to live their lives as truly devoted Jews, Jews devoted to the Torah and its laws, fulfilling the daily mitzvot and acting as Jews? If not, why not? Of course, there are many differences between your questions and mine. In fact, an operation to benefit the Jews of your community (along with it having precedence in Jewish law, "din kadima") can be carried out without the necessity of assistance from the American Congress and without the approval of any foreign government. Furthermore, such an operation would undoubtedly be successful -- it depends only on you and your willingness and determination to carry out such an urgent action. 8 Surely there is no need to explain to you the conditions in America -- including in your state and in your city -- that so very many Jews -- men, women and young children -- are carried away on the stream of assimilation, influenced by foreign surroundings that leads to intermarriage, etc. So many of them are lost to our people day-after-day, and, according to our sages, even the soul of one Jew is regarded as an entire world, and certainly it is so with regard to the rescue of so many of our brothers [from assimilation]. I must say that the purpose of my letter to you is not to argue with you or even to give you mussar (“moral guidance”) because I do not know you. Your letter is one of very many letters I receive and your letter does not fit in with any of them. It occurs to me that perhaps it is providential (“hashgakha pratit”), and that this gives me the opportunity to bring to your attention the fact that the many Jews nearby you have important needs and that an effort must be made to reach and save them -- they have the priority, the first claim on Jews like you. May G-d give you the correct answers to answer my questions, not for my self-indulgence but for the sake of our brethren (“acheynu b’nai yisrael”), especially the younger generation in your city, assuming that you are a resident there for at least a few years or perhaps were born there. P.S. I would like to respectfully ask you as an additional question related to this matter: In what way can it be helpful to this issue (that you are so angry about) for you to be well-informed on what I do or do not do to benefit it? 1. The Rebbe was writing to a university student who at that time had already been very active in outreach efforts on his campus, in his city and, in fact, throughout North America for several years, including working with Chabad-Lubavitch representatives in his city and across the country, and would continue to do so for many years to come. 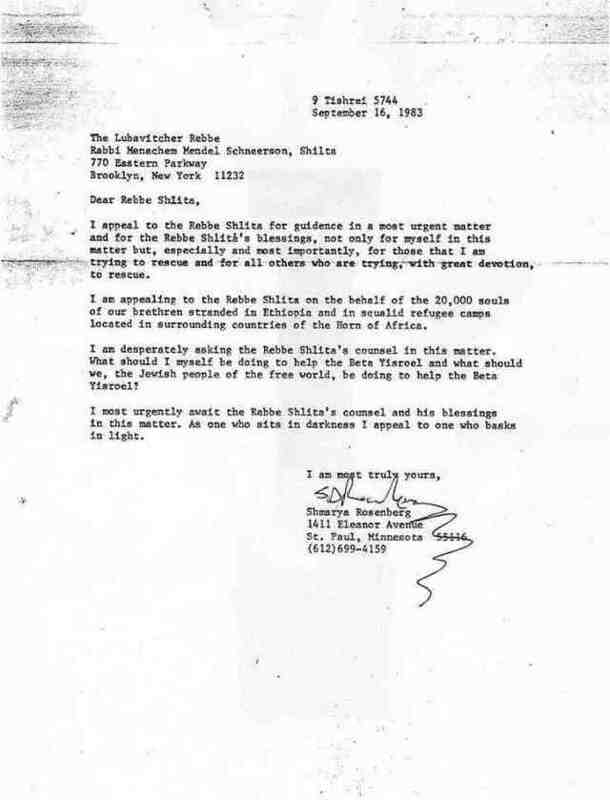 His first contact with Lubavitch had come almost two years before this when he hand-delivered to Chabad-Lubavitch representative Rabbi Moshe Feller a letter smuggled out of Ethiopia from Ethiopian Jewish leaders to American rabbis desperately pleading for help and describing the horrible situation in Ethiopia. The student asked Rabbi Feller to send a copy of that letter to the Rebbe. It appears from the Rebbe's letter that this was not done. The student also had extensive contact with Chabad leadership in Brooklyn and repeatedly asked them to help Ethiopian Jews. They refused, and either did not pass along the student's requests to the Rebbe, or, if they did, the Rebbe simply ignored them. As the Rebbe's letter soon makes clear, and as Chabad's subsequent actions demonstrate, Chabad's position is that a Jewish educational project in Minnesota is more important than saving the lives of starving tortured African Jews. 2. “Greetings and Blessings!”, a standard opening to a letter in rabbinic Hebrew discourse. 3. Rabbi Moshe Feinstein, the Dean of the Rabbinic Court of Agudat HaRabbonim, had already ruled that Ethiopian Jews must be saved and had widely publicized that ruling. Rabbi Feinstein and Agudat HaRabbonim would soon rule again, very publicly, that Ethiopian Jews must be saved and that one can certainly and must in fact violate all Sabbath restrictions in order to carry out the rescue if it be necessary to do so. The Rebbe did not listen to either decision, and continued to withhold help, both with rescue and with absorption and acclimation to Israeli society and modern Judaism. 4. Note the previous letter on Ethiopian Jews sent September 16, 1983 and published here for the first time. Also note that many requests for help and guidance had already been made verbally through representatives of Lubavitch in Minnesota, Crown Heights -- including Rabbi Yehuda Krinsky, the Rebbe’s secretary and public relations person -- and other locations throughout North America, without any response from the Rebbe. 5. Getting Congress to pass resolutions declaring the Rebbe’s birthday as “Education Day, USA,” was part of their duties, however. 6. Here is a copy of the Congressional Resolution I asked Chabad-Lubavitch and the Rebbe to support. 7. The Rebbe was asked to send Chabad 'Mitzva Tanks' into absorption centers to visit Ethiopian Jews. That is what the Rebbe is referring to when he says the projects mentioned "are not logical and they do not fit in with the activities and duties of Chabad-Lubavitch institutions of representatives." 8. Chabad was unwilling to help with that, as well.